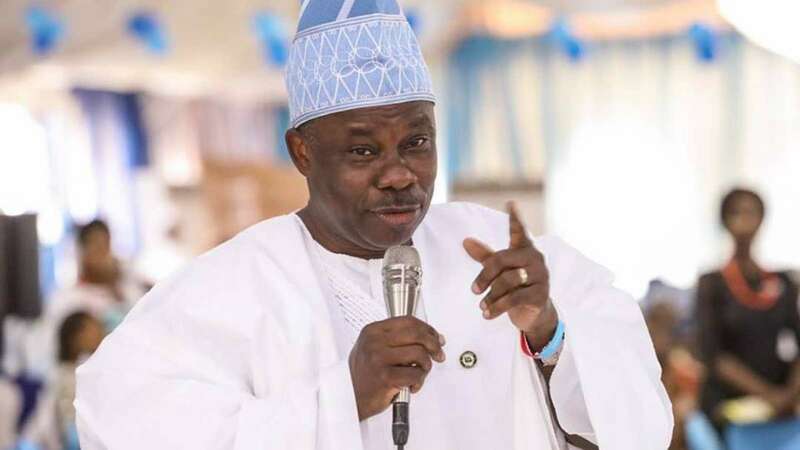 Governor Ogun State Ibukunle Amosun has distanced himself from the crisis faced by the National Chairman of the All Progressives Congress (APC), Comrade Adams Oshiomhole. The APC national chairman was reportedly quizzed by officials of the Department of State Services (DSS) on Sunday over a complaint from some aggrieved governors that he allegedly received bribes during the recently held primary elections of the party. According to the reports, Oshiomhole, during the DSS interrogation, was asked to resign from his position as national chairman. The APC chairman has been engaged in a war of words with the Governor of Imo State, Rochas Okorocha and his Ogun state counterpart, Amosun. The two governors had openly criticized the party chairman for rejecting their preferred candidates for the 2019 general elections. Speaking to State House Correspondents after a closed-door meeting with President Muhammadu Buhari at the presidential villa, Abuja, Amosun said he has no hand in the troubles that the party chairman was facing. He said: “I think you are probably giving me an oversight role and I am not a security person. So, clearly, I think that question will not be for me. I don’t have to hide under a finger to fight. If there is a need for me to put my views across, you know me by now that I will do it.” The Ogun State Governor, while answering questions on the whereabouts of the APC national chairman, explained that, “I have told you those things are beyond my pedigree and you are asking me questions that I am not well suited for. The one that I have to talk about, we have said it loud and clear that it doesn’t event need to add anything.” Meanwhile, the Peoples Democratic Party (PDP) has called on national and international security agencies to hunt down Oshiomhole and bring him to justice. PDP in a statement, yesterday, by its National Publicity Secretary, Kola Ologbondiyan, said Oshiomhole’s sudden flight out of the country was suspect. According to the party, the APC National Chairman travelled out of the country after his alleged interrogation by the Department of State Services (DSS) for corruption charges. “It is ludicrous that the APC, in its lying proclivities, believes that by dismissing Oshiomhole’s arrest as a rumour and aiding him to momentarily flee the country, it would succeed in getting him off the DSS hook as well as sweeping the matter out of public discourse with its famished broom,” PDP said. It, therefore, called on the National Intelligence Agency (NIA) and INTERPOL to track him down and bring him back to Nigeria to answer the charges against him. The party accused President Muhammadu Buhari of shielding Oshiomhole from prosecution for fear that his investigation would implicate certain interests at the presidency and the APC. “Nigerians are already aware that Oshiomhole has not denied his investigation, including his reported confession that the presidency was in the know of all his actions,” the party noted. It warned the APC National Chairman that “his arrogance, lust for power and alleged embezzlement of public funds must surely make him have his day in the hands of the law.” PDP demanded that APC and the presidency should immediately produce Oshiomhole to face investigation and prosecution in the courts.